The 6 1/2-pound boy was taken to St. Margaret Hospital in a police district car summoned by the store manager. 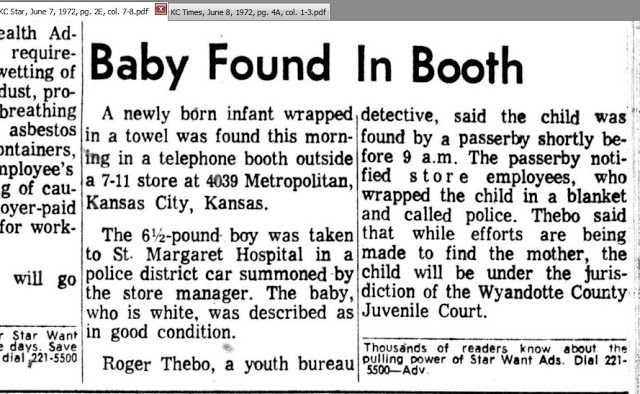 The baby, who is white, was described as in good condition. Roger Thebo, a youth bureau detective, said the child was found by a passerby shortly before 9 a.m. The passerby notified store employees, who wrapped the child in a blanket and called police. Thebo said that while efforts are being made to find the mother, the child will be under the jurisdiction of the Wyandotte County Juvenile Court.